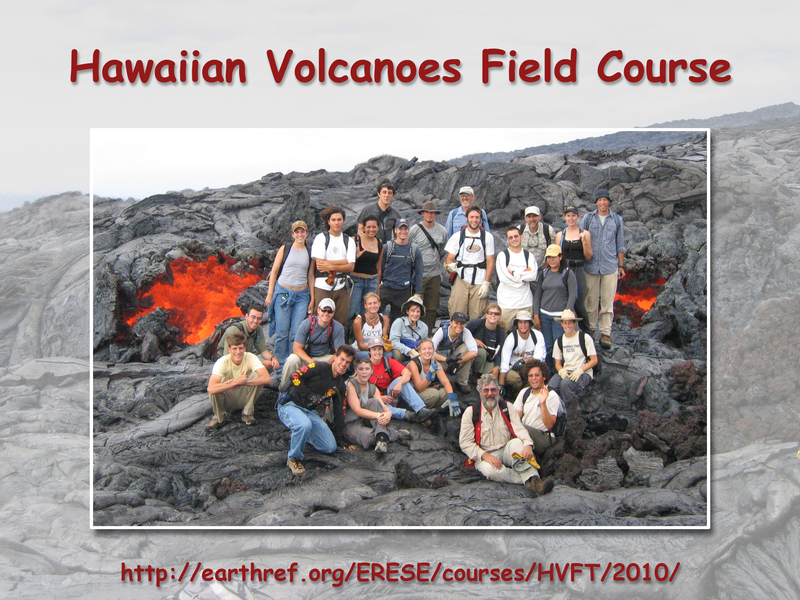 Welcome to the home page for the Hawaiian Volcanoes Field Course 2010 organized by Hubert Staudigel, Lisa Tauxe and our newest faculty member, Geoff Cook. 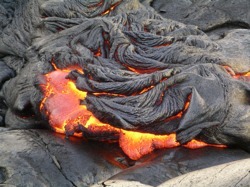 On this website you can find practical information about the field trip itself, our syllabus, prerequisites costs, how to apply and register for the class, the grading, and, last not least how Madame Pele might decide on whether this class can actually happen or not. This is a Fall Quarter 2010 class that runs for two weeks September 7-20, following a series of volcanology classes that we previously ran jointly with the UC Davis campus. For cost-cutting reasons we will modify the earlier format and do all of the sit-down class work in San Diego in the first three days of the class, then travel to Hawaii for the (mostly on-foot) field classes, and finally we have the field work exam after our return to San Diego on September 20. The class will also include a seminar at 3-4 pm on Wednesdays during the Fall Quarter. Offered by the Graduate Department of Scripps Institution Of Oceanography at University of California San Diego. You can take this course as 6 units for SIO 170. Instructors are Hubert Staudigel and Geoff Cook. If you are interested in the class, please find more detailed information in the Links panel. Participants will stay at the Kilauea Military Camp (KMC) located at the north edge of Kilauea crater in Hawaii National Park. Some classroom work will be held at UCSD before and after the field portion of the class. There will be a pre-field-trip Organizational Meeting on May 28 noon in the Munk Conference Room at IGPP on the Scripps Campus. Total Costs (approximate): $1630 (not including tuition expenses). This includes: (1)	Course fee $450 (check due with application), (2)	Airline travel $750 (individually booked by students, after the course is officially going as per announcement on June 30, (3) Lodging is covered in the course fee, (4)	Food in Hawaii $200 (breakfast, lunch and dinner, with frugal life style), (5)	Shuttle to and from KMC $30, (6)	Books (Volcanoes by P. Francis and Kilauea Volcano by R. Hazlett), boots, incidentals $200. Financial Aid (a $500 subsidy to offset course expenses) will be available for the first eight qualified students. SIO 50, SIO 100 and CHEM 6A or consent of the instructor. Department Stamp is Required (contact SIO Undergraduate office for clearance), 18 years or older, and the ability to hike 10-15 miles/day over rough terrain. This course may be taken for a letter grade or P/NP. For undergraduates using SIO 170 to meet a major requirement you must enroll in LETTER GRADE ONLY. The grade will be based on participation, written assignments, mid-term and a final exam. Application is required before May 24 and the class size is limited to a minimum of 8 and a maximum of 18 and is on a first come first served basis. Consider applying early! (1) Send in an Application Letter by e-mail to hstaudigel@ucsd.edu (cc to ltauxe@ucsd.edu and cduncanson@ucsd.edu). Application e-mails should include the following information: Your full name, age, gender, address, preferred e-mail address, phone (including cell phone), as well as the name, address, e-mail and phone information of your next-to-kin who serves as your emergency contact. Students applying for a subsidy also have to provide information regarding their GPA and write a paragraph describing their motivation for taking the class and why they deserve a subsidy. (2)	When your e-mail application is accepted, contact the SIO undergraduate office for Clearance. (3) Register for the class online at the UCSD website. (4) Send the $450 check with the Full Course Fee to Hubert Staudigel, IGPP, mail code 0225, and made payable to the Regents of the University of California. The course fee does not include tuition (6 units) which are incurred when you enroll in SIO 170, Fall 10. Please apply early, because this process is likely to take a few days. Your application is not final until we receive your course-fee check and you have enrolled in SIO 170. From then on you are committed to the program, but your check will not be cashed until June 30 when the decision is made that travel to the volcano is safe and the class can be held based on current volcanic activity. Checks for the potentially cancelled class will be returned promptly to the address given in your application letter.